Copyright 1999 The Author(s) - The University is continuing to endeavour to trace the copyright owner(s) and in the meantime this item has been reproduced here in good faith. We would be pleased to hear from the copyright owner(s). While eucalypts are virtually endemic to Australia, they are probably the most widely planted hardwood trees in the world due to their fast growth and favourable qualities for pulpwood production (Eldridge eta!. 1993; Downes eta!. 1997). as well as numerous secondary uses (Boland et at. 1991 ). Exotic land races have become established in many countries (Eldridge et at. I 993 ), yet there is still considerable demand for seed collected from the wild in Australia for species and provenance selection, breeding and deployment purposes. Many eucalypt breeding programs around the world are currently constructing breeding populations from OP (openpollinated) family trials derived from large scale seed collections of native stands. We use the case of Eucal}ptus globulus to outline the genetic framework established, and biological constraints encountered, in the exploitation of these eucalypt base populations. 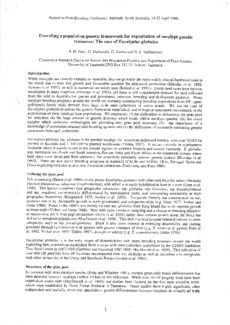 We emphasise: (i) the difficulties in delineating the gene pool for selection; (ii) the large amount of genetic diversity which exists within eucalypt species; (iii) the novel insights which molecular technologies are providing into gene pool structure; (iv) the importance of a knowledge of population structure and breeding systems and (v) the difficulties of accurately estimating genetic parameters from such collections.